In July 1991 four adventurous souls completed a three week canoe trip on the Horton River in the Northwest Territories. Among them was long term local and President of the Whistler Museum board, John Hetherington, as well as Whistler Ski Patrolman Pat “Dago” Coulter. The Horton River is one of the most remote rivers in North America, though it deserves great renown. The river has several distinct features: it empties into the Arctic Ocean at a point further north than any other mainland river in Canada, it runs alongside the Smoking Hills (it broke through the Smoking Hills to Franklin Bay around 1800AD, cutting off the last 120 kilometres of river), and it is now in the process of creating a new delta. As part of the Whistler Museum Speaker Series, John Hetherington will be sharing photographs and stories from this remarkable adventure. 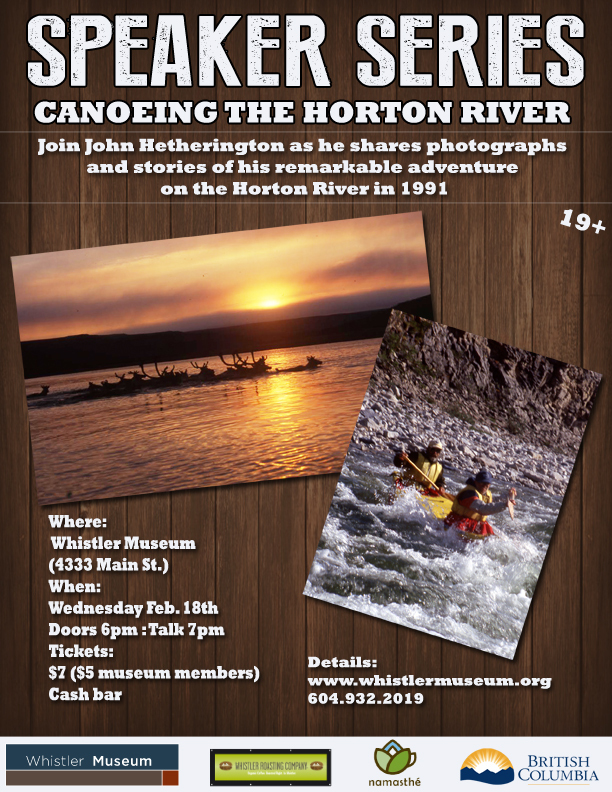 The event, “Canoeing the Horton River,” will take place on Wednesday, February 18th, from 7 to 9pm (doors are at 6pm) at the museum. Tickets are $7 each ($5 for museum members) and can be purchased by telephone or in person from Whistler Museum. There will be a cash bar and complimentary tea and coffee. Anyone interested in the Canadian Arctic, canoeing, adventure sports, or anything to do with the Canadian wilderness should not miss this one.